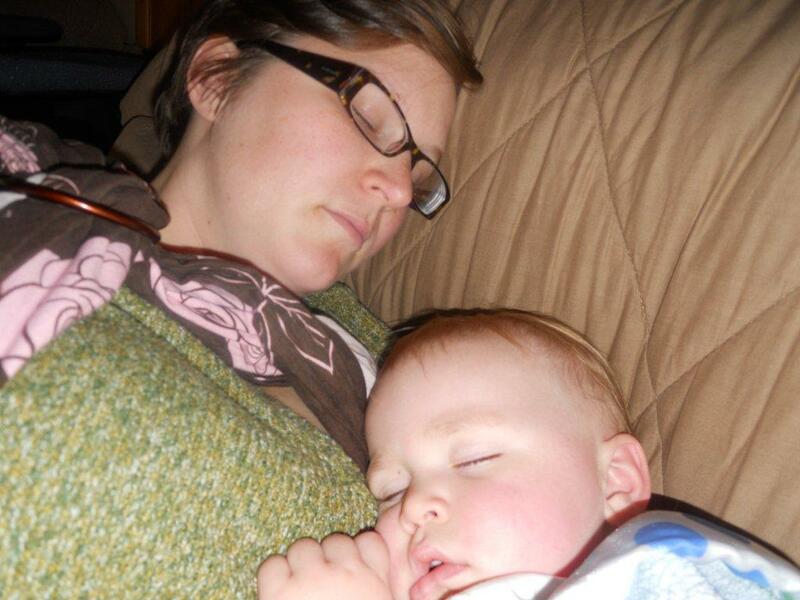 This week we asked: What does nighttime parenting look like? It was only a few hours before we needed to put up this week’s Wordless Wednesday post, and we still had only a couple nighttime pictures — we put out another call and ended up with this smashing smorgasbord! Enjoy seeing all the different (and adorable!) 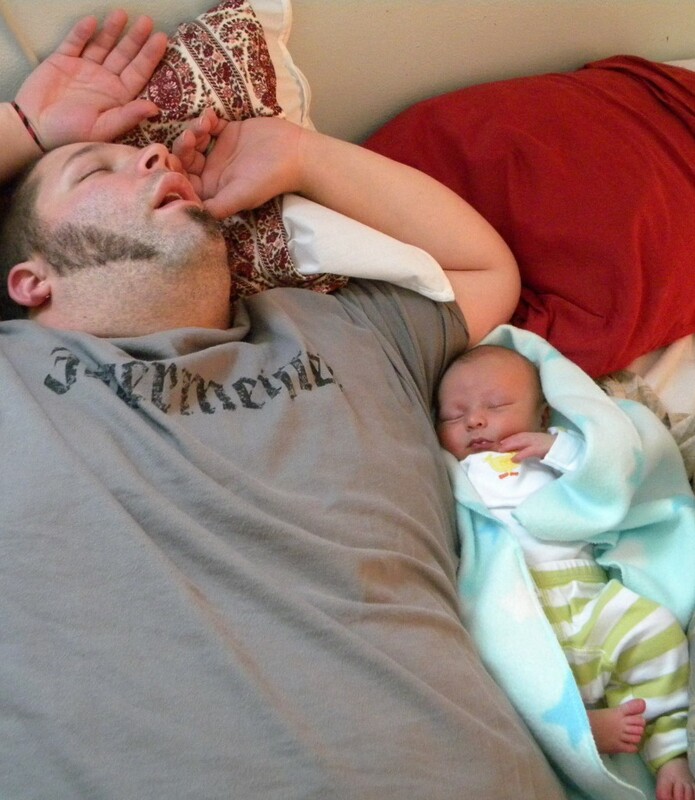 ways naturally minded parents arrange their family’s sleep. Baby Kellis (now 16 months old) cuddles with daddy Kellis last year when all he did was sleep and snuggle. 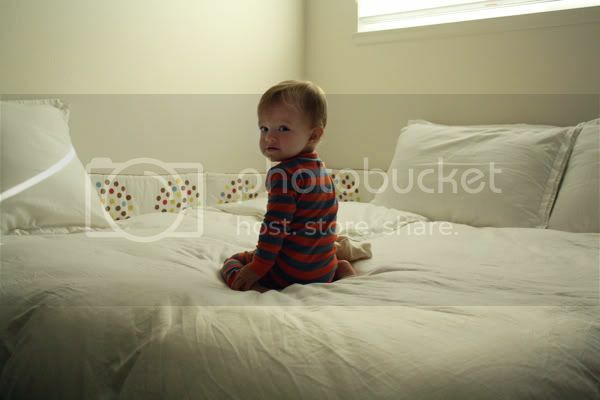 Amy at Anktangle‘s view at bedtime of baby Daniel at 2.5 months, safe and snug in bed between his parents. each other up and were playing. To fit everyone in on one bed, the family went from a sidecarred crib to a king size mattress! Stephanie and her wonderful son, Walker (4 months) — he had just finished nursing and they lay in bed talking for a half-hour before getting up for the day! 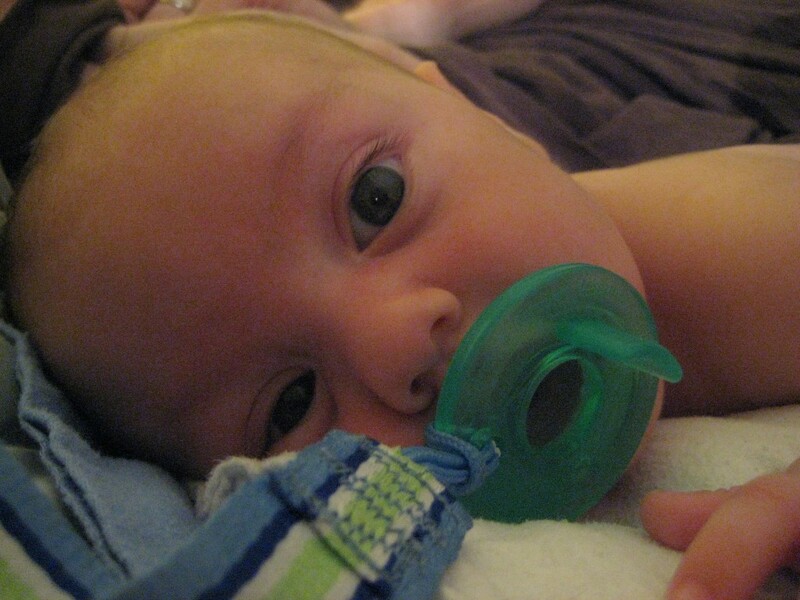 As a single mom, Stephanie loves co-sleeping with her little man. They each start on their own side and end up sleeping nose to nose after an hour! 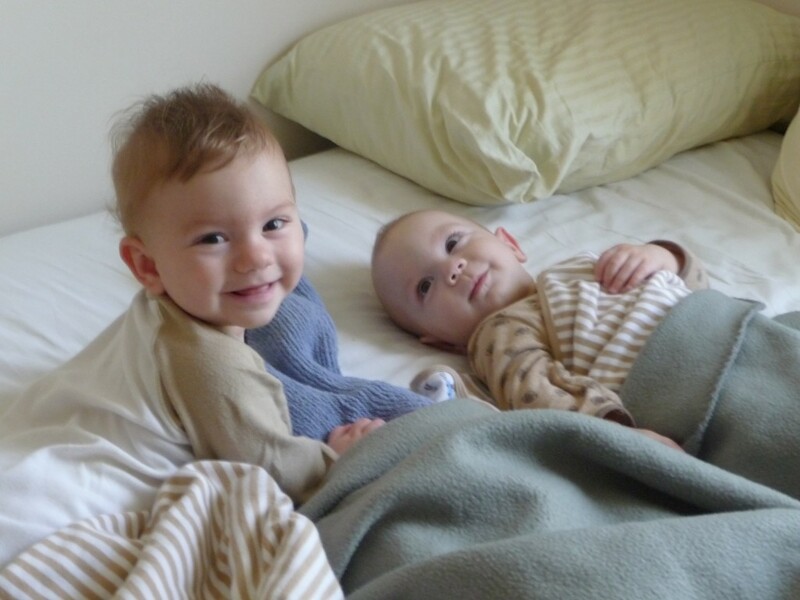 Sara of Bonzo, Chooch and Me has a fun tutorial called “co-sleeping perfected” on how she and Bonzo (16 months old) transitioned from using a co-sleeper to having Chooch engineer a platform addition to their family bed. 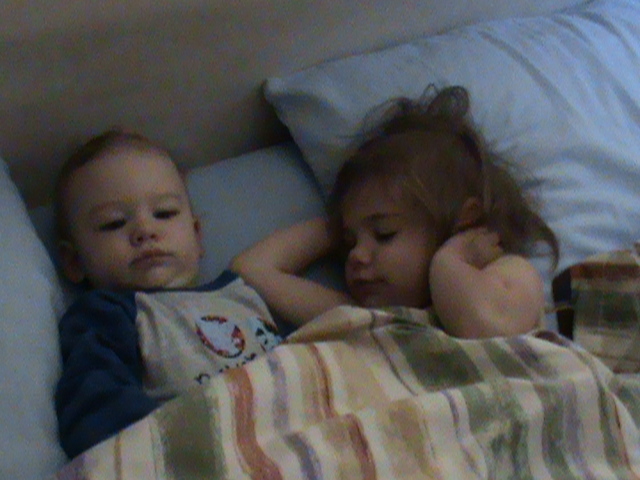 Jenn’s little ones enjoy waking up together. Jenn blogs at Connected Mom. Callie (right) and Veronica (left) have nursed to sleep and co-slept since they were born nearly 23 months ago. This is one of the many positions they’ve been found in when parents Tracy and Thomas go in to join them. Daddy Neal and son Ilan (at 7 months, now 16 months old). He is a thumb sucker just like his daddy was. Mom Heather blogs at naturally diff…. 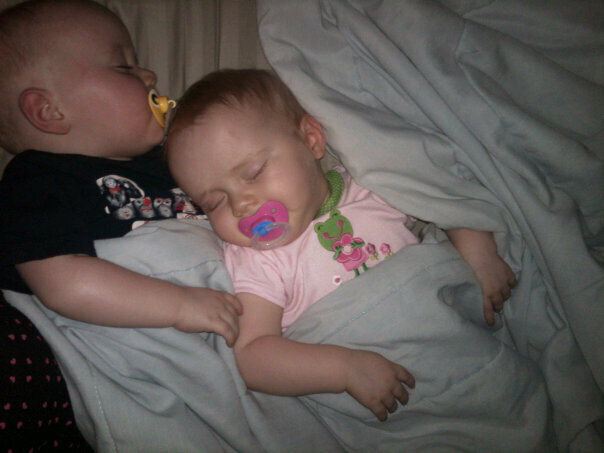 Laura’s twins Aiden and Sophia snuggling in sleep. 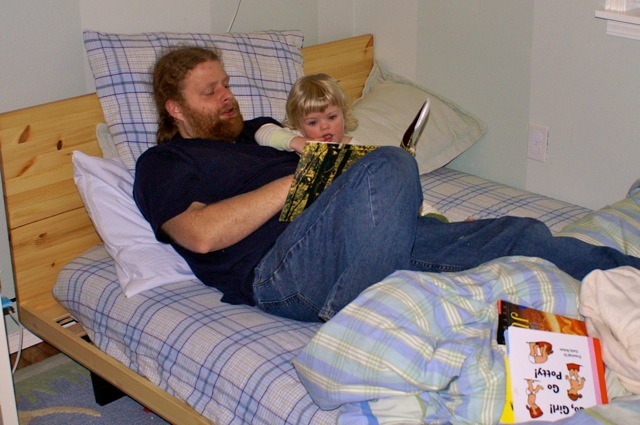 This is transitioning Emma to her own bed at 18 months, by choosing one her parents can sleep with her in, and having Daddy take on bedtime duties. Emma’s mom, Kristin, blogs at Intrepid Murmurings. 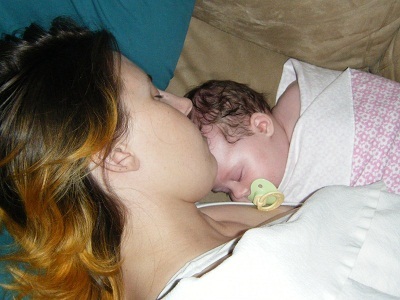 Mommy and Julia taking a post-Thanksgiving dinner nap. Sara blogs at This Mom Loves…. Jeremy and Oscar, 3.5 years old, cosleep along with Missy. Missy blogs at a work in progress…. In the early months, Momma Jorje slept many nights on the couch with Sasha. A year later, their bed is still HER bed, too. These days Jorje counts herself lucky that Sasha shares HER bed! 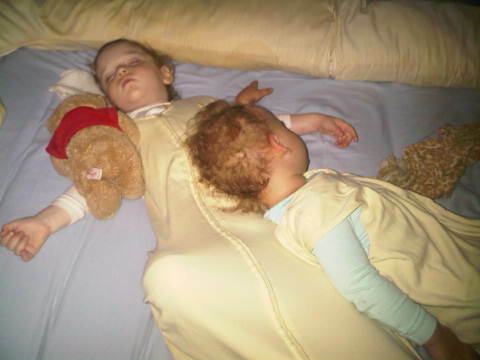 Kara sneaked out of the bed at nap time to capture this photo of her 4-year-old and 8-month-old sleeping! Four in the bed! This is Melissa, Aelyn, Layla, and Lane. Lauren and husband Sam have been cosleeping with Mikko (11 weeks here) since the very first night. 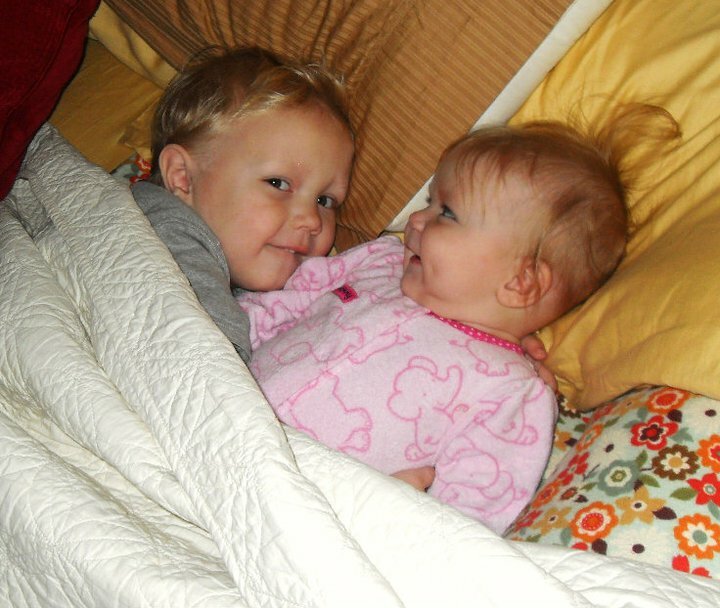 Toni’s little ones, Presleigh (2) and Max (8 months), snuggle close. 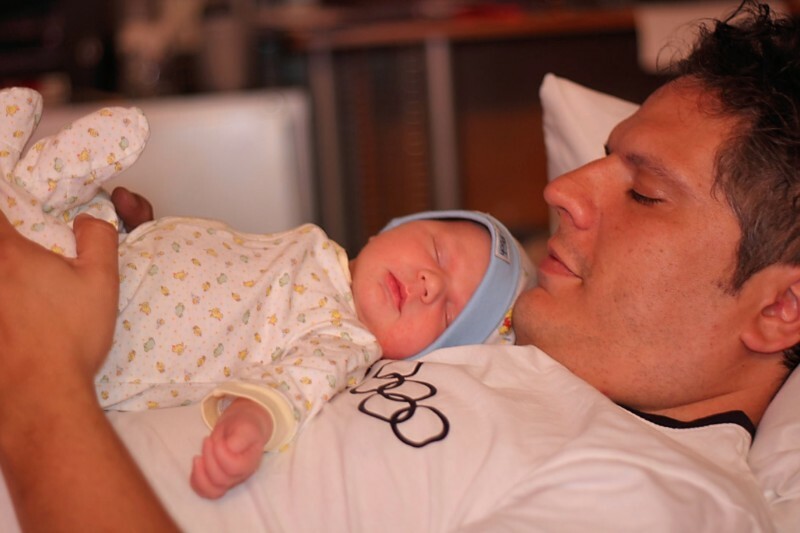 Ambra’s husband, Evan, and baby Cohen at 2 weeks old. 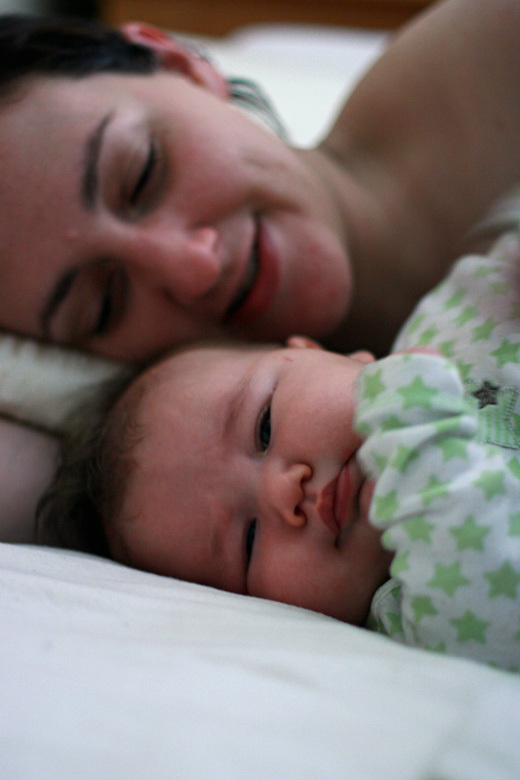 Ambra, blogs at Our wonderfully, joyfully, perfectly imperfect life and Naturally Mama. SunRa blogs at Mama Jedi. Just waking up from a nap — mama took the time to read a really good book! Megan blogs at Purple Dancing Dahlias. 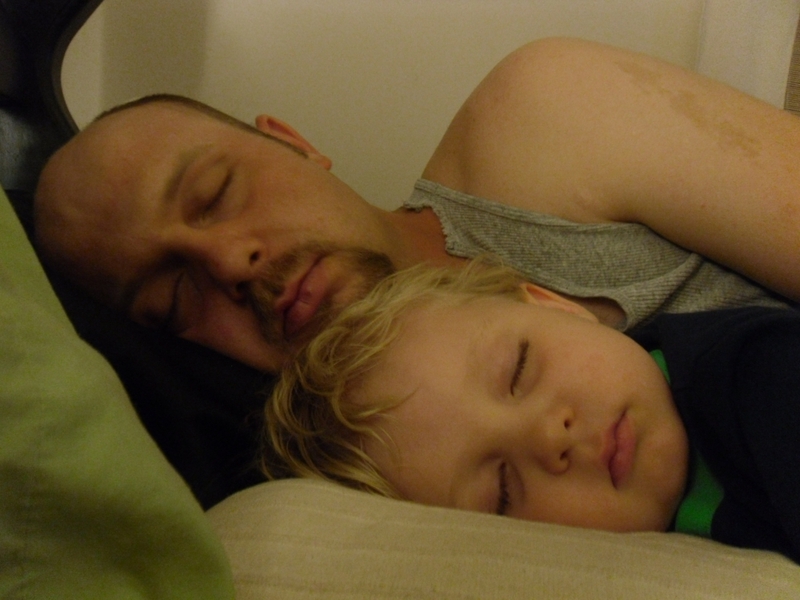 Tell us: What does nighttime parenting look like in your family? So, so sweet!! Honestly, what is sweeter than sharing sleep with a babe?! Those are such heart warming pictures! My youngest (now 5 1/2) still joins us in bed frequently. Oh, I love the 4-in-bed Family Photo! That would make a great idea for Family Portraits, really. I can’t imagine *not* sleeping with my baby and just think of the money we save on cribs (those of us that co-sleep full time)! I love that so many dads are in on the WW, too. I absolutely LOVE these pictures. My favorite ones are the ones with all the dads….so sweet! 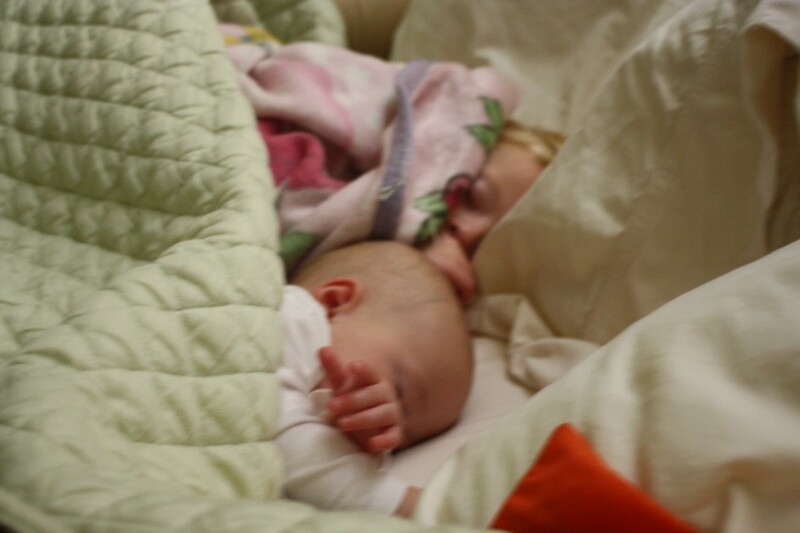 so is looking at all these sweet, snuggly faces from all these cozy co-sleeping photos! beautiful, and very memorable photos. precious. Ah, love them all, especially the twin ones! So cute! These are so adorable. I especially love the ones of kids snuggled in close to each other. 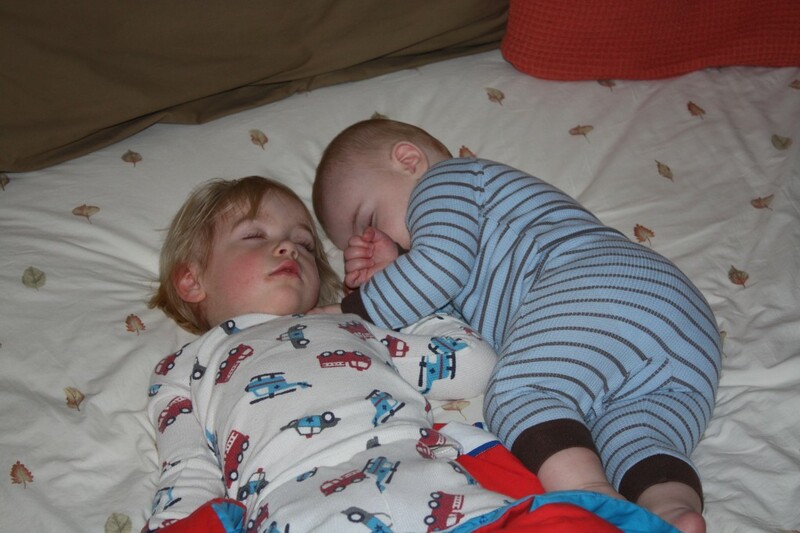 I have a cute one of my baby and 3yo sleeping together that I wish I had gotten to you. LOVE these! There’s something about snuggling, sleeping babies that sure hits my soft spot! awwwww these photos are so lovely… nice to see happy babies and parents enjoying nap time together, not in separate rooms/beds. I also love the cuddly twin pictures! We co-sleep with our one baby but I’d never thought about more than one!